Over the years many people have mentioned that they wish car navigation devices had a Kiwi accent that they can relate to. We told you in our September blog that TomTom was running a competition to find that special iconic voice. Well it’s a done deal as told in this NZ Herald article. Ben Harper (no not the musician) has won himself a new Suzuki Swift RS and a new TomTom. We are told that you will be able to download his voice in time for your Christmas road trip. TomTom New Zealand is running a very cool competition together with The Edge radio station. Have you ever thought about what you would say if you could control the voice on your nav unit. Move over John Cleese and Homer Simpson bro, it’s time for a Kiwi voice. Over the next few weeks you have the opportunity to enter a competition which will decide not only whose voice will end up as the voice of New Ziilund, but every day someone will win a TomTom and the grand prize winner will win a Suzuki Swift. 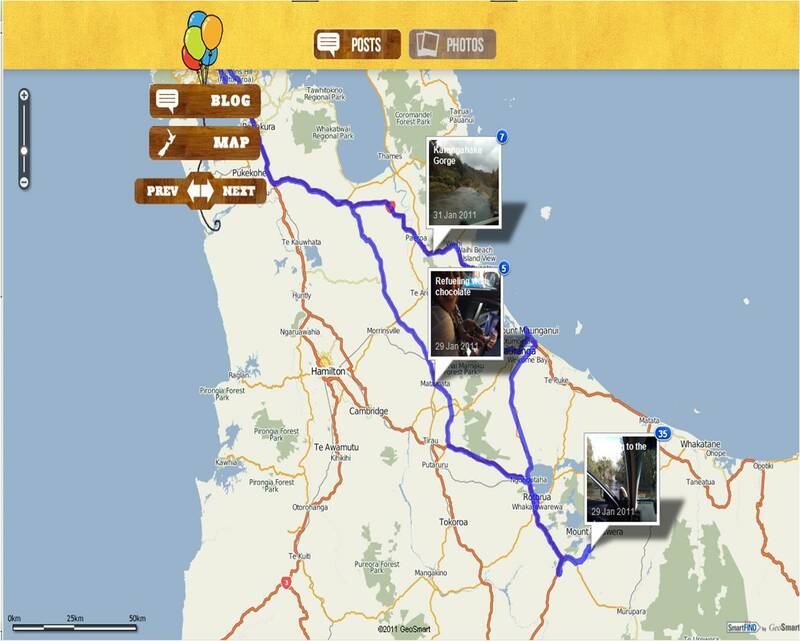 You can listen to the entries on The Edge competition page, such as yesterday’s TomTom winner “Sweet As” and the Suzuki is being kitted up as a recording studio and doing a road trip around New Zealand where you can meet it and record your TomTom GPS voice. 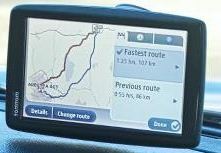 The TomTom road trip starts in Invercargill on Monday 4 October and works its way up to Northland on 15 October. You can of course also enter online. So put on your best Kiwi accent and join the fun. 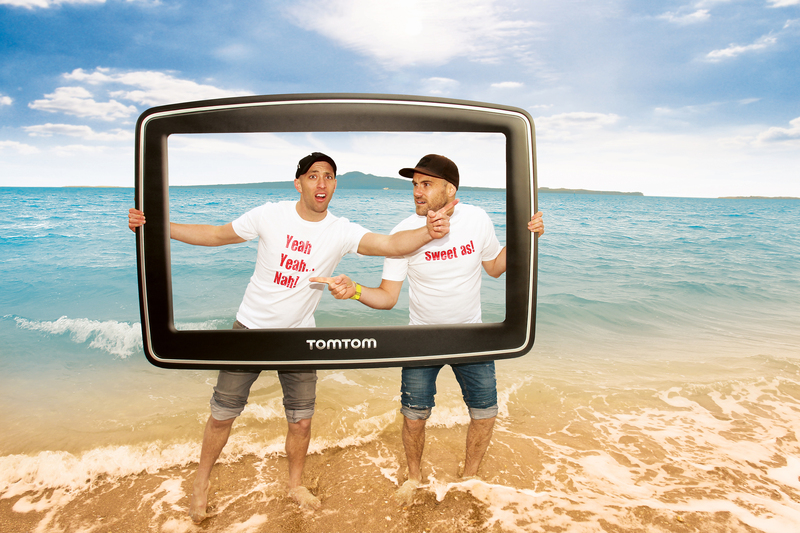 Carl Fletcher and Vaughan Smith, hosts of The EDGE Fletch & Vaughan show, have already put their hands up to potentially become voices and are excited to find the person to be the new TomTom GPS voice of New Zealand. “I mean imagine being THE voice that is chosen as most iconically Kiwi, how much of an ego boost is that? Your voice could be the voice that represents all Kiwis and is used worldwide by anyone with a TomTom GPS. We have so many unique sayings that we can throw in there as well to really Kiwi it up, I mean there’s ‘sweet as bro,’ ‘choice eh’…and then the classics like ‘yeah yeah…nah’. It’s going to be an epic campaign, with an epic prize to boot,” says Fletch. Wow, where did the year go? 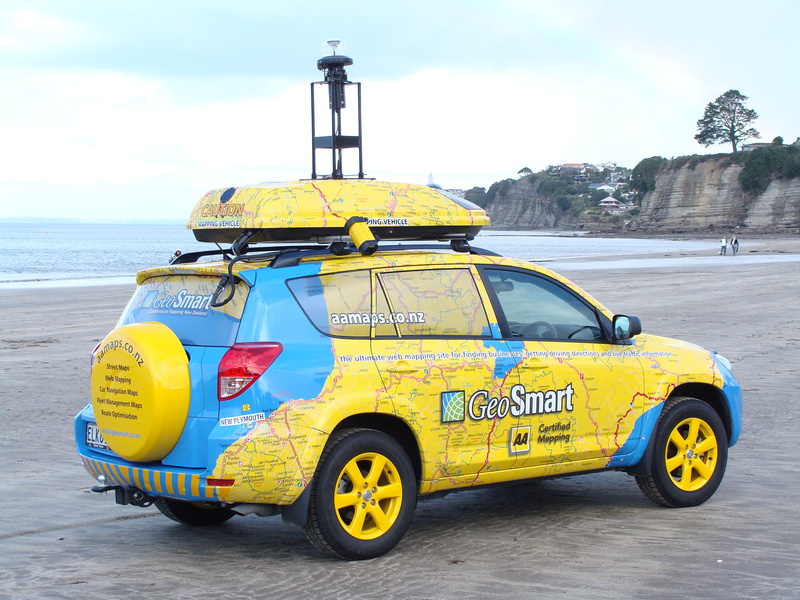 This has been a huge year for GeoSmart and 10 looks to be equally exciting. If you want to catch up with us, you have a few hours before we close for summer holidays. We re-open on 11 January. The big one for the year just gone has to be AA Traffic. This was a long time in the planning and it has been very exciting for us to set up this real time traffic service covering all of New Zealand. Have you tried it yet? Check the Traffic web site before you go on holiday. You will find that we have extended the free email and txt alerts until the end of January. You may have finished work, but accidents and other incidents don’t go on holiday. On the traffic page you will also find that we have Cook Straight Ferries as well as domestic and international airline departures and arrivals for Auckland and Christchurch airports. If you set up a free account, you can have Roadwatch automatically open up to the area you live, work or play in so that you can see if there is anything you need to know about. Road works and ramp closures can be really frustrating, so this is a good place to keep an eye out for anything that might get in your way. They are time sensitive, so it is worth looking at before you get in the car, you can also click on Upcoming Events, to see if there is anything happening in the future that might make you want to change your plans. If you haven’t already, you will see that our AA Maps website is continuously evolving with new features. One of my favourites is the proximity feature. Pick an address or Point of Interest and you will see that you can now look for something within a 5km radius. For example if you were going to Rotorua for Christmas, you could look for restaurants or bars within walking distance of your accommodation. You can also plan an entire itinerary, and drag and drop and drop the stops to help you fit more into your time while saving gas and carbon emissions. You can plan your trip, drag the route on the map to change the roads you will drive on and print it all out to take in the car. Of course you can view AA Traffic incidents and web cams on AA Maps as well, which again makes it a great site to check before you hop in your car. Of course we love our partners TomTom very much too. Their IQ Routes (which of course uses our road data) has even surprised me on occasion in finding a new way to drive home, that I had never thought of. Other than AA Traffic, they share all the same excellent information that our other car navigation partners do. We continue to add new data to our car nav solutions including 3D buildings, lane guidance and enhanced Points of Interest data. Car nav is a never ending part of our product development and we stay aware of all the new developments and features that our partners are planning so that we can offer the best possible data for New Zealand going forward. Of course our data collection and driving never end. The RAPIDcV continues to collect lots of valuable data and we have some exciting plans for enhancing this in the new year. We have joined the adoption of social networking with a Facebook Fan Page where we are engaging with the public with competitions and discussion related to traffic issues. We also have a Twitter page, which we use in a similar way to share information and develop a community of people interested in supporting our efforts to share up to date information. We have a number of new web mapping clients and several more that will go live early in the new year. For businesses who want quality map data, routing and access to our extensive Points of Interest database, our data is updated 11 times a year making sure that you can rely on our products. We feature some of those sites on our home page. We launched the new Route2GO web service, which was a long time coming. We have so many companies who have been waiting for this and are very exciting to see new 3rd party solutions being developed that will help businesses with route optimisation as well as calculation of fair pricing for freight and travel costs. Whether it is a large transport company, a taxi service or a furniture shop with a single van, we now have a solution that will make life easy for you. We are working with and seeking new partners who would like to integrate these tools into their solutions for their clients as our model is to work with partners, not to compete with our clients in developing end user products. There have been exciting developments in Fleet Management and we have had many new companies join us this year for everything from vehicle tracking to Road User Charges, with a number starting to adopt the concept of digital hubometers. RUC is here to stay and with over 80% of Fleet Management companies using our data, it would be fair to say that it is the standard. We are working on many off shore projects and you will hear our name much more often outside of New Zealand, mostly with partners. A major part of our IP is the knowledge of how to build quality map datasets and then provide web services and API’s around this data. We ran the Location Innovation Awards and in May we sent the lucky winner to the USA to attend the Where 2.0 Conference. We are going to run the 2010 Location Innovation Awards and have already had some exciting offers of sponsorship in prizes and technical support. We are changing the timing this year to make it easy for our university partners to fit the Awards into their calendar, as we were very excited about the work that many students, especially at Massey University prepared. New Zealand has a huge amount of untapped talent and we look forward to helping the legends of the future make themselves known. Location Based Services are going to hit their straps in the next couple of years and you will see the GeoSmart name a lot in this context. If you haven’t seen them, we now have regular e-newsletters. We used to print them, but print means cutting down trees and isn’t as multidimensional. You can find them here and also subscribe if you would like them in your inbox. If you are still with me, thanks for reading this blog. There was much more activity that I could tell you about, but it’s time to take a deep breath and recharge, ready for the most exciting year yet in 10. I hope that you will be a part of that with us as I wish you and yours a very Merry Christmas and warm happy holidays. Thanks to everyone at GeoSmart and our many partners for helping to make this year the success it has been. We look forward to catching up with you soon. Feedback from people affected by the bus strike varied. Several said that they enjoyed walking or cycling to work and, subject to weather conditions would continue to do that. Others had more difficulty, such as having to catch taxis to hospital appointments or getting children to school. It is likely that for some time at least, many commuters will go back to the comfort of the car, some even saying that driving is cheaper and more convenient. 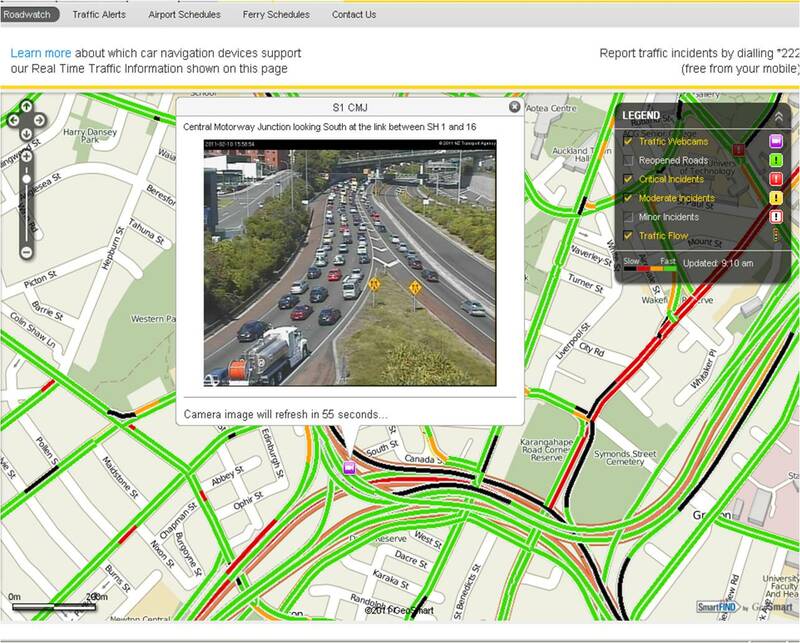 AA Traffic is a new service developed by GeoSmart Maps for the New Zealand Automobile Association, which offers email and SMS traffic alerts, as well as displaying them at AA Maps, Roadwatch and sent direct to certain Navman car navigation devices, which is offering extra special deals for AA Members. Every now and then I hear a story about someone who feels that their car navigation device is not giving them an appropriate route and telling them to turn the car around at the earliest convenience. These days most car navigation devices are so intuitive that nobody reads the manuals. They charge the device up, stick it on the windscreen and get driving. In fact that is pretty much what brands like TomTom encourage you to do. They do also encourage you to go to TomTom Home via your PC and the Internet to download the latest map as well as the current configuration of the satellites so that you get a quick connection in the car. But this is not what I am writing about. If you buy a new car navigation device using our maps (and given that we have 93% marketshare in the industry, in most cases it is our maps) you can pretty much rely on them being accurate. There are 2 main reasons why people don’t always get the result they expected. 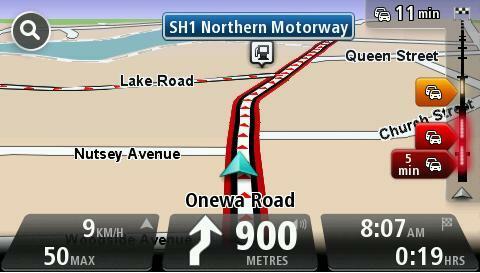 By default your GPS unit is programmed to navigate via the ‘Fastest Route’. The way that works is that it will have a preference for the higher road classes, i.e. main roads, motorways, expressways and so on. The first reason for that is that major roads are designed for faster throughput. Often the speed limit is higher so you can drive faster. That means that if you can get to your destination by parallel roads such as Great South Rd in Auckland and Manukau and the Southern Motorway, the Southern Motorway will usually be much faster. You can program your car navigation device to drive by the ‘Shortest Route.’ Now it will compute your route solely on driving distance. In some areas this may be quicker, for example many rural roads in the Waikato are long straight roads and in many cases have very little traffic. This could make the journey faster, but this is local knowledge. In urban areas taking the shortest route may well mean getting stuck at compulsory ‘Stop’ or ‘Give Way’ signs at the major roads while the traffic using the ‘Fastest Route’ zips past in front of you while you are waiting. Some devices, such as some of the Navman models allow you to use a ‘slider’ function which allows you to weight the routing style to a balance that you like. This is complex and unless you know what you are doing, I would stick with ‘Fastest’ and only change to ‘Shortest’ where you are pretty certain it will get you there on time. Another factor is local knowledge. When you commute or go to certain places regularly, you will have learned about the odd bottleneck which doesn’t conform to the general rules. The GPS unit is a computer and designed to work within a set framework and a local bottleneck does not come into the equation, yet. So the best scenario is to use a combination of your local knowledge and the instructions from your nav unit. Some devices have a lot more functionality. For example they might let you avoid main roads or motorways, avoid toll roads or gravel roads and so on. If you spend a lot of time driving to unfamiliar places, it really is worth having a look through all the menu options to see what you can do. There are many other levels of information in your device including a large file of Points of Interest. These include everything from your favourite brand of petrol, ATM, accomodation or food, as well as public toilets, boat ramps and pretty much everything you could wish to drive to including emergancy locations such as hospitals, accident & emergancy. You can look for these closest to the car or near your destination. In summary, what you have is a highly sophisticated computer and like most computer programs, most people only use a small percentage of its functionality. I recommend that you start using it on ‘Fastest Routing’ until you are familiar with how it works. Try ‘shortest’ when you are not in a hurry, or when you are travelling short distances. Then either read the manual or go through the set up screens and check out all the other great functionality your device has to offer. You will be pleased that you did.